Palestinian Authority Chairman Mahmoud Abbas on Friday apologized to the Jewish nation for his anti-Semitic speech. "I condemn the Holocaust, which was the most heinous crime in human history," Abbas said. "If anyone, especially anyone of the Jewish religion, was insulted by what I told the Palestinian National Council, I apologize to them. On Monday, Abbas claimed the Holocaust was not caused by anti-Semitism, but by the "social behavior" of the Jews, including money-lending. He also claimed Jews have no connection to the Land of Israel, blaming Israel for killing 2,027 "Palestinian" children in the past seventeen years and threatening to sue Israel. On Tuesday, US Ambassador to Israel David Friedman slammed Abbas, asserting that Abbas had reached "a new low." 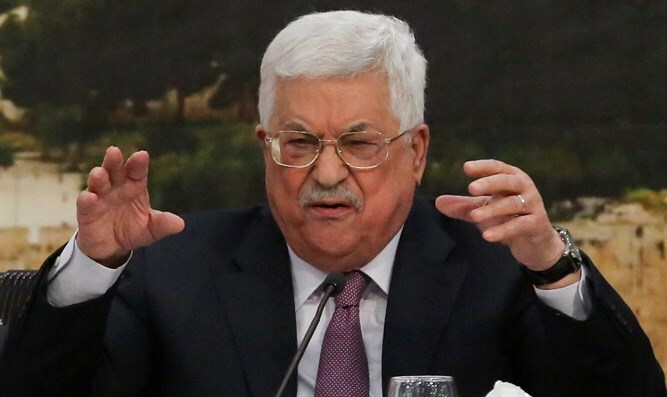 "[Abbas] has reached a new low in attributing the cause of massacres of Jewish people over the years to their 'social behavior relating to interest and banks.' To all those who think Israel is the reason that we don't have peace, think again," tweeted Friedman. Israeli Prime Minister Binyamin Netanyahu responded on Wednesday to Abbas speech, saying, "Abu Mazen [Abbas] again recited the most contemptible anti-Semitic canards. Apparently the Holocaust-denier is still a Holocaust-denier." "I call on the international community to condemn Abu Mazen’s severe anti-Semitism. The time has come for it to pass from the world."